The cinema billed it as “the story of the most ambitious television series ever made”. 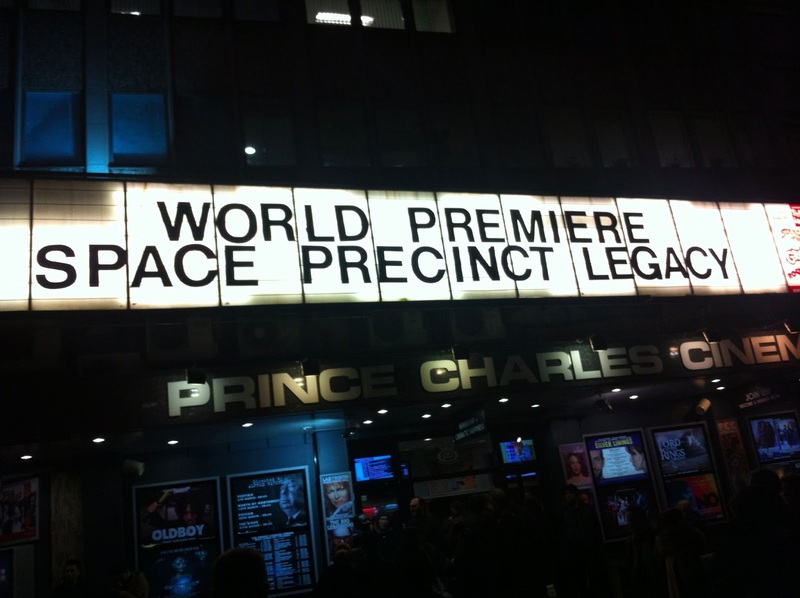 Outside, the hoarding lit up the night sky: Space Precinct Legacy. I can’t believe that anyone actually remembers Space Precinct, the 1994 sci-fi series I co-produced with Gerry Anderson, let alone that it has any legacy, other than grey hairs on my head and a big red loss on the books of our backers. 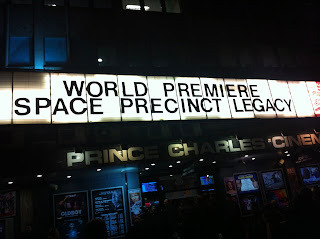 But now some fans have made a feature documentary about the series and last Wednesday, in London’s Leicester Square, I was invited to the premiere. It was nicely made, with interviews with cast and crew, including yours truly, and scores of behind-the-scenes stills. Here's a trailer. My son Ben accompanied me: he was 13 when he came to the set and met Gerry Anderson's son Jamie, who was then just 10. Now they're both around thirty, yet at the premiere they reminisced with excitement about diving into the props store and sitting in the flying police cars in the studio. Gerry, who died last December, was a legend. 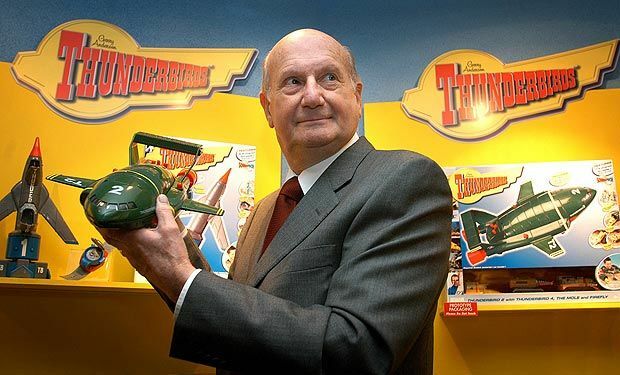 Thunderbirds, Captain Scarlet, Fireball XL5: these were highlights of my childhood. 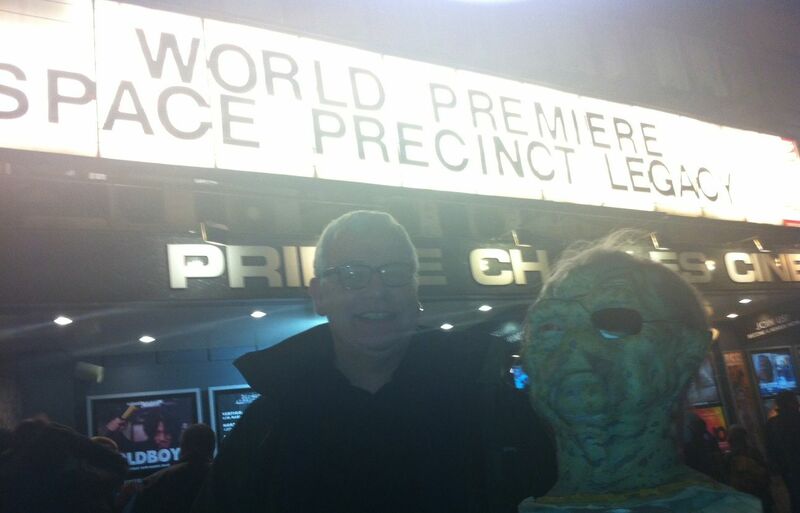 One day a colleague of mine met Gerry, who told him about a live action series he desperately wanted to make. 10 years before, he’d filmed a pilot that nobody wanted to buy, about a retired New York cop called Brogan who was sent to Demeter City on the planet Altor to sort out their crime wave – a kind of Law & Order with aliens. The criminals wore prosthetics masks with animatronic eyeballs and bled green blood. 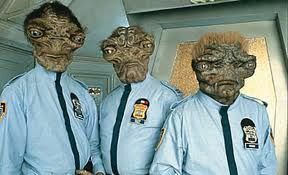 So did Brogan’s alien police colleagues. It was a hoot. I’d recently won my one and only drama Emmy and I was keen to get into fiction big time, so I agreed to become Gerry’s business partner. A small distributor in America claimed to have a rich backer who would fund the entire $36million budget, the most expensive series ever made in the UK, so we set Gerry up at Pinewood, and started production. From the outset, the budget was tight. Gerry had insisted on using big name producers and directors from feature films, and their fees were as big as some of their egos. We hired special effects people more used to the budgets of film than television. Computer graphics were in their infancy, so many of the effects had to be done the old-fashioned, expensive way, with real explosions and models on strings. Something had to give: the scripts were hurried and unpolished and the sets worse than those on Emmerdale. But it nearly didn’t get made at all. And I very nearly went bankrupt. We’d made a little taster, using Gerry’s original pilot and some extra scenes shot at Pinewood, and I took it a big television conference in New Orleans, where I’d been invited to a pitching competition. It was worse than any episode of The X-Factor. The judges were top broadcasters – Greg Dyke played Simon Cowell. The previous pitchers were in tears, their projects destroyed. Greg tried to do the same to ours: no-one will buy this show, he declared to the audience of 2000 television executives. There was silence. Then a man in the middle of the hall put up his hand: “My name is Kloiber; I wish to buy this series for Germany – I will pay $100,000 per episode”. Cheers rang round the hall. Other buyers put up their hands. We were in production within a week. But the drama didn’t end there. For, shortly after we’d finished the first episode, the American money dried up. We ploughed on as my overdraft grew to nearly £2million. A planeload of black-suited lawyers arrived from America to shut us down. They said the distributor had conned them, the mystery backer knew nothing about the show: he had been swindled. With aliens being shot by rayguns in the studio next door, I produced a single fax message from the backer, proving that he and his company knew all about it. It was the only proof I had. They adjourned the meeting, and returned 2 hours later with a cheque for £2million and a contract. Quite how we got through to the end is as mysterious as some of the Space Precinct plots. 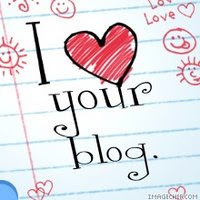 But its 24 episodes were eventually broadcast to huge ratings on Sky, and were repeated on BBC2, and it did appear in America, albeit syndicated between hundreds of tiny stations, mostly at 2am. They enjoyed it on Herr Kloiber's German stations, apparently. It’s no wonder some of the crew interviewed for the documentary felt ambivalent about the result. It wasn’t exactly their finest hour, or Anderson’s or mine. But we survived, and several of the team went on to fame and fortune with big movies like James Bond. So perhaps there is a legacy of Space Precinct after all.